Florastor Kids is a clinically-tested, natural, yeast-based probiotic that aids in the growth of good microbiota in the intestines, while destroying and removing pathogenic (bad or disease-causing) microbiota to help maintain or restore optimal intestinal health. Unique because it can be safely given to babies and children from the age of two months, Florastor Kids is a great-tasting powder that can be dissolved in beverages, including infant formula, or soft foods, such as applesauce. Florastor probiotic supplements have been clinically tested and sold internationally for more than 50 years. The active ingredient in Florastor Kids is mentioned by the World Health Organization for the management of C. diff-associated diarrhea (Saccharomyces boulardii: a valuable adjunct in recurrent Clostridium difficile disease (1995) WHO Drug Information; 9; (1); 15-16). Florastor Kids is now available at most national chain pharmacies throughout the U.S. at numerous retail outlets. Studies that support Florastor Kids’ efficacy and safety can be viewed at www.sboulardii.com. 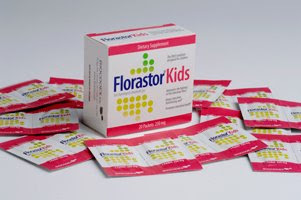 Florastor Kids is available in a box of 10 powder packets for a suggested price of $12.95 and in a box of 20 powder packets for a suggested price of $21.95. Florastor Kids is available in most retail chain pharmacies, and at independent pharmacies. Visit www.florastor.com to find out where to purchase Florastor Kids in your area. It is commonly found in the anti-diarrheal/stomach aid section, and can also be obtained by asking the pharmacist (many stores keep Florastor Kids behind the counter). It can also be purchased online at www.drugstore.com or www.newtimrx.com/florastor.html. For more information, see the Q&A with James Sears, MD, here. We didn't necessarily "need" this product due to no diarrhea, but my daughter seems to get sick quite often, and a majority of your immune system is located in your stomach. So, I've been having her take it for about the last week or so. She loves the flavor of it! We mix it in with some water, or some applesauce, and it's good to go. I'm glad we have this product on hand! Would you like to win a box of Florastor Kids? To win, leave a comment on this post. This giveaway is open to all US residents and will end on 5/13/09. Thanks to for letting my family try this product! My 3yo granddaughter is in need of this. After going to the Dr several times for being constipated, they finally put her on a suppository. I would say this would probably be better for her and work better too. Also, I am following you on twitter! See? NOW I am following your blog on FB! Wow, creepy. great product, the intenstines are really an important part of the immune system. I'm going to go the product page and save it! I'd like to try this! I am subscribed to you feed!